thank you very much for the care taken to the apartment, your kindness. We had a really lovely week at Catherine's apartment in La Rochelle. The apartment was clean and adequately equipped, but we didn't spend a lot of time in it! The balcony looking over the beach and the sea is fabulous and we spent a lot of time sitting there watching the world go by and admiring the view! The apartment complex and surrounding area was very quiet at night and meant we slept very well. There are plenty of bars and restaurants within walking distance and the bakery two minutes away was superb. The directions weren't the best and, once we had found it, we couldn't find a way to get into the complex...but a call to Catherine soon sorted the problem. It was good to meet Catherine who was very kind and courteous. We would recommend the apartment and the location to anyone. Comfortable apartment in a fantastic spot. Very relaxing break as everything so convenient. Highly recommended. We recently stayed at Catherine’s apartment for a week and thoroughly enjoyed our stay. We received a warm welcome and the apartment was clean and had everything we needed. 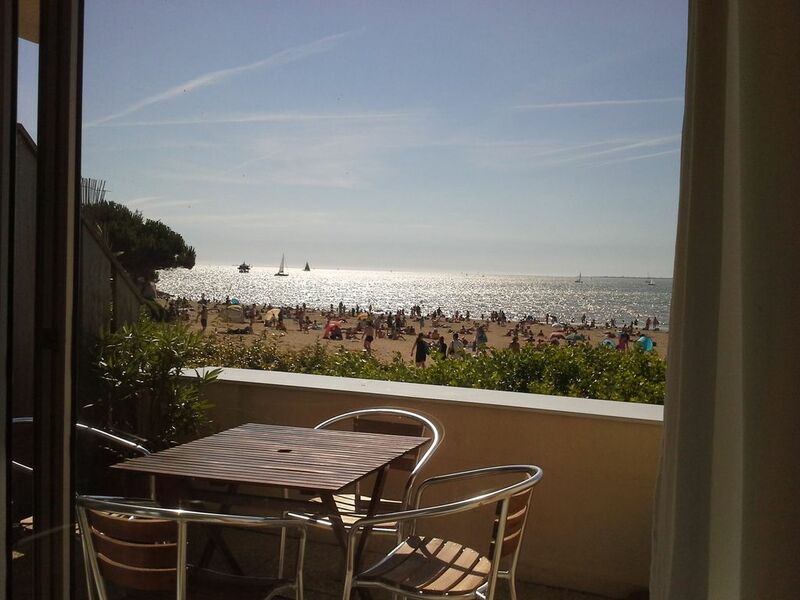 It’s location close to the beach was great for our little ones, with a great bakery and some handy restaurants nearby. We had a huge bowl of mussels at Le Recif, great food and service at Le Cargo and had good fish ‘n’ chips at Le Merluchon. The ice cream at Tonton Maboule was excellent, with biq queues as very popular. There were only a couple of small negatives: there is no decent super market nearby, it’s a 15 to 20 minute walk to the nearest Carrefour or catch the 43 bus (€1.30) from right outside the apartment on Rue Lucile. There was also no broadband for Internet access, though we had good 4G data access, so not much of a problem for us. I’d definitely recommend this property for a beach family holiday. You have à Lovely family! Nice tout meet you again. Have to say we were not sure what the apartment would be like but we were really delighted. Very clean and neat and a perfect location, lovely few days. Fantastic location and views. Very clean. Friendly host. Ideal holiday apartment. This is our second year running - we love it so much! The location and views are wonderful and the apartment has everything we need. The owner Catherine is really helpful and friendly - even though we had failed to pay the second instalment! We would recommend it to anyone. Thank you very much Mick and Trish! Thank you for your kindness, your cleanliness and all the confidence that has settled between us. (Text automatically translated) Port and Aquarium La Rochelle, Ile de Ré, Rochefort and Royal Rope, Hermione, Futuroscope. Restaurants and shops nearby beach.